The beach of Agioi Anargyroi on the island of Alonissos in Greece, information and pictures. 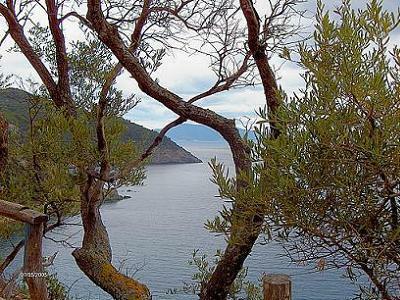 The picture shows a view to Alonissos island from Agioi Anargyroi. This small pebble beach of Agioi Anargyroi is quite isolated and lies in the west of the island. The water is pretty cold up here and has a green blue colour. On the right hand side of the beach behind the rocks there is a cave to which you can swim to. However, you have to take a dive into the water to get into the cave. The cave is lit by a hole in the rock above. The beach is named after the nearby Byzantine church of Agioi Anargyroi, which dates from the 13th century. It stands at the end of a cliff and from here there is a fantastic view over the Aegean Sea. From this church there is a dirt road through the forest that leads to the beach. You pass the ruins of a villa and a building with benches for walkers. To the left of Agioi Anargyroi is another small beach to which you can swim in about five minutes. This beach is called Tourkoneri and it is surrounded by pine forest.